Context: Work–family conflict (WFC) is a consequence of imbalance and incompatibility, which influences the health and family relationship of nurses negatively and creates challenges for the individual and the organization. Aim: To explain the nurses' view on the stressful effects of conflict between work and family on their lifestyle. 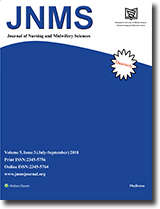 Setting and Design: This qualitative investigation was a conventional content analysis and conducted by the use of purposive sampling selecting 25 nurses. Material and Methods: Unstructured interview was performed, and data were analyzed using inductive content analysis. The credibility and objectivity of the data were repeatedly checked by incorporating the data-gathering process, variety of participants and monitoring the participants in the investigation. Statistical Analysis Used: Data analysis was conducted by Graneheim and Lundman approach. The unit analysis in this study was the whole interviews, and the meaning units were distinguished in the statements and texts of the interview in the form of “sentence” or “paragraph” from which the open codes were extracted. Then, the categories, main categories, and themes were abstracted. Results: The final findings consist of two main themes: (i) the predisposing factors/the sources of WFC and (ii) coping/stress management and obstacles that each of which is formed by some categories. The core of the nurses' efforts for eliminating WFC is creation of balance between different factors. Conclusion: Thus, resolving the problem is possible to use in access to resources and proportional circumstances. We propose that, in different societies, qualitative study be conducted on to explore preventive strategies and policies. Context: The evidence suggests that the communication skills of the emergency department personnel are not optimal, and the employees are not prepared to deal with the violent behaviors of patients and their relatives. Aims: This study aimed to determine the effect of anger management training on controlling the perceived violence and aggression of nurses in emergency departments. Setting and Design: This quasi-experimental study was conducted on 112 nurses in emergency departments of educational healthcare centers of Gorgan, Iran, in 2017. Materials and Methods: Nurses were randomly divided into test and control group. In the test group, training of anger management skills was carried out in person, followed by 2-month virtual training, including short messages related to the skill of anger management delivered via Telegram. No specific measure was obtained in the control group. The subjects filled out an anger management skill questionnaire before and after the intervention. Statistical Analysis: Data were analyzed using paired t-test, Wilcoxon test, and Mann–Whitney U-test with P < 0.05. Results: The mean ages of the subjects in the test and control groups were 30.25 ± 3.02 and 28.58 ± 4.16 years, respectively. The comparison of exposure level to verbal violence in the control group was low in the beginning of the study, which had a significant increase at the end of the investigation (P = 0.001). There was a significant difference between the level of exposure to physical violence in the test group before and after the intervention (P = 0.007), whereas no change was observed in the control group (P = 0.91). Only in the test group, there was a reduction in the level of exposure to sexual anger, and the difference was statistically significant (P = 0.006). Conclusion: According to the results of the present study, running workshops and following the trainings via the internet reduced the score of exposure to physical and sexual aggression in nurses. Context: There is considerable empirical evidence about the psychosocial vulnerability of children of parents with mental illness (COPMI). Nonetheless, these children's experiences and needs have still known poorly. Aims: This study was conducted to explore the mental health needs of COPMI. Settings and Design: The grounded theory approach was deployed. Material and Methods: Semi-structured interviews were held with 17 participants who had been recruited purposively and theoretically from a psychiatric teaching hospital located in Qazvin, Iran 2008–2010. Statistical Analysis Used: The data were analyzed using Strauss and Corbin method (1998). Results: After relating the main concepts of the study, the “COPMI need theory” was formulated. This theory explains children's needs, changes of needs in the cycle of parents' illness, the process of fulfilling the needs, and outcomes-driven from need fulfillment. Conclusions: Based on findings, recommendations were provided to mental health professionals who for dealing with families and children of patients with mental disorders. Context: Religion and spirituality are considered as sources for adaptation to life-threatening events such as anxiety. Aims: The purpose of this study was to determine the level of religious attitude and anxiety. Settings and Design: This is a descriptive study of analytical type. In this study, 102 students were selected by the census method in 3 months. Material and Methods: The data collection tools were demographic questionnaires, Serajzadeh's religious attitude standard, and Achilles Berger's anxiety. Based on Likert scale, there are five options that I totally agree with and disagree with. Statistical Analysis Used: The normal data from the questionnaire will be examined using Kolmogorov–Smirnov to examine normal distribution. After collecting data and coding, to analyze the data, the central indicators and dispersion including mean, mean, fashion, standard deviation and independent t-test, Pearson correlation coefficient were used using the SPSS-16 software. Results: The results showed that the mean anxiety level was 4.24 ± 52.12 and religious attitude was 67.97 ± 35.15. The highest mean score was related to beliefs, and the lowest was the post-nursing dimension in religious attitude. Most of the participants showed a high level of anxiety and high religious attitude. There was no significant difference between the dimensions of the religious attitude, and the level of anxiety of the groups (P > 0.05). However with an increase in religious attitude, the level of anxiety has decreased. Conclusion: The results of this study showed that the religious attitude of the participants in the strong level and the anxiety level was moderate. In this study, it was found that both groups did not have a significant difference from religious viewpoint and its dimensions and anxiety disorder. Furthermore, in studying the effect of variables, it was found that there was no significant relationship between religious beliefs and anxiety levels with the variables. However, the increase in religious attitude has been accompanied by low anxiety. Context: Cancer is one of the main causes of death and disability throughout the world and leaves different effects on various dimensions of physical, psychological, sexual, social, and economic functions of human life. Aims: The present study was conducted in 2017 with the aim to examine the quality of life of hospitalized patients with cancer in Arak, Iran. Setting and Design: The present cross-sectional descriptive analytical study was conducted in Khonsari Hospital in Arak (From May to October 2017). Materials and Methods: Three hundred and twenty cancer patients selected using census sampling method. Data were collected using demographic questionnaire and the standard quality of life assessment questionnaire European Organization for Research and Treatment of Cancer-Quality of Life Questionnaire-C30. Inclusion criteria were hospitalization, 3 months after diagnosis, and patients have no metastasis. Statistical Analysis Used: Statistical tests such as Chi-square test, Fisher's exact test, and t-test were used. Significant level was considered as α = 0.5. Results: Types of cancer included 31.3% (100 patients) leukemia, 20.9% (67 patients) gastrointestinal cancer, 14.1% (45 patients) breast and ovarian cancer, 8.8% (28 patients) lymphoma, 6.3% (20 patients) lung cancer, 5.3% (17 patients) skeletal cancer, 4.4% (14 patients) renal cancer, 4.7% (15 patients) skin cancer, and 4.4% (14 patients) head-and-neck cancer. Mean quality of life of participating patients was 64.46 ± 14.48. The highest (73.21 ± 21.57) and the lowest (55.4 ± 12.56) mean score of quality of life belonged to patients with head-and-neck cancer and skin cancer, respectively. In general, patients performed better in physical dimension and poorer in social dimension. Patients' quality of life was found significantly related to age, place of residence, marital status, and education level (P = 0.0001). Fatigue was the most common nagging symptom in both sexes, with slightly higher level in men compared to women (P = 0.8). Conclusion: The mean quality of life of the patients was good. However, patients performed poorly in social dimension. To enhance their social performance, plans will, therefore, need to be developed and implemented. Context: Elderly is regarded as a critical period of human life, which the related issues and needs in this period are socially necessitated to be taken into consideration, especially in the elderly with heart disease. Depression is an important problem in elderly period. Older age peoples with chronic disease such as cardiovascular disease experience less life expectancy. Aims: Considering the importance of this issue, the present study was designed to determine the relationship between depression and older age heart patients' life expectancy in the heart center of Mazandaran. Setting and Design: This descriptive-correlative study was conducted on 212 patients selected through simple random sampling heart center of Mazandaran in 2017. Material and Method: Data collection tools included a demographic questionnaire, Beck Depression Inventory questionnaire, and life expectancy questionnaire (adult hope scale). Results: The mean age of the participants was 67.15 ± 6.22 years. The mean depression scale was 21.5 ± 11.19. Based on the results, 26.4% showed no sign of depression, 55.2% were slightly depressed, 13.8% were moderately depressed, and 4.7% were severely depressed. The total score of life expectancy in elderly age was 39.6 ± 6.31. There was no significant relationship between depression and life expectancy (P = 0.4). Conclusion: Based on the findings, slightly depressed was common among the elderly with heart disease. Thus, more attention is necessary to be paid to this specific topic, and some preventative measures are essential in the elderly with heart diseases. They had optimal practice toward life expectancy that needs to more attention and healthy communication and strong family connections in order to maintain and continue optimal life expectancy.